A beautiful thing happened a couple weeks ago. I rummaged through the fridge, took out a bunch of random foods and put together a meal. And not just any meal. It was a entire meal that fed all four mouths at the table. It was a fill-you-up-without-feeling-stuffed, let’s-make-this-again-soon type of meal. And it was SO good! Truth be told, I took my own advice and made it again for lunch a couple days later! The delicious food that magically appeared in my fridge? 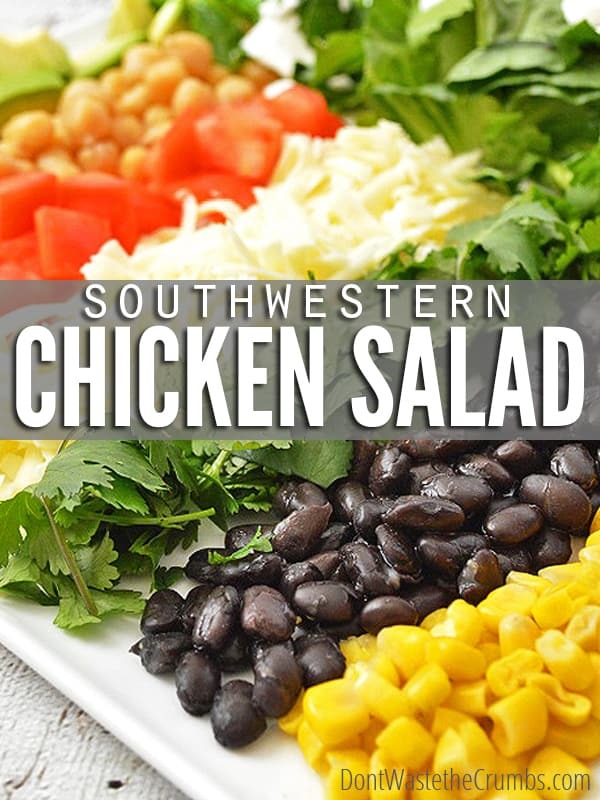 A southwestern chicken salad. 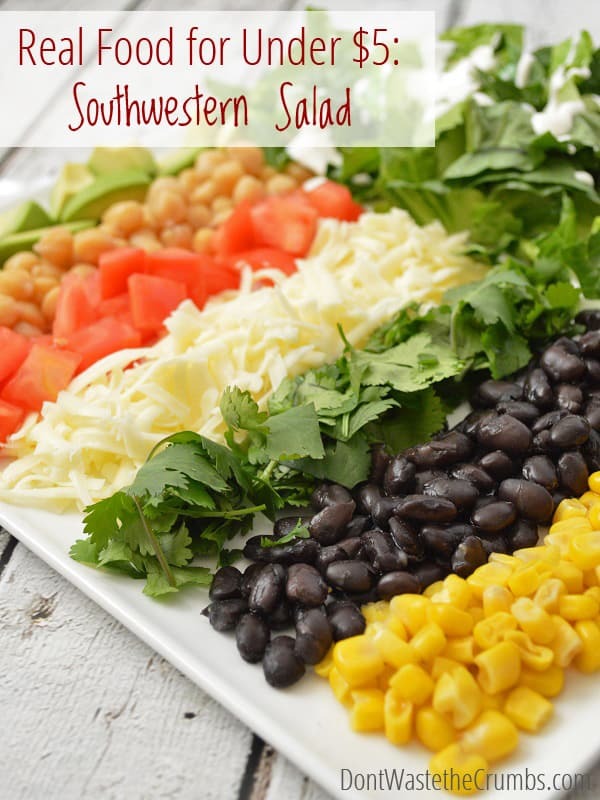 The southwestern chicken salad is my ultimate favorite salad of all time. Back when Mr. Crumbs and I didn’t have kids and spent way too much eating out at restaurants? I always ordered this salad. And if it was topped with a bit of buffalo ranch dressing? Oh gosh. Stick a fork in me, I’m done. I honestly believe that if there’s one food that can fit nearly every type of personality out there, it’s the salad. There are seriously about a million different types of salads out there, so if you find one you don’t like, just try another. The southwestern chicken salad is my ultimate fav (yes, it bears repeating), but you might like beets & strawberries or steak & blue cheese. Side dishes like potato salad, caprese salad or the slightly similar cucumber & tomato alinado count as salads too, and there’s another million or so of those types of salads to choose from as well. It’s just a matter of finding the salad that best fits you. Hmmm… maybe we should try throwing together a salad-fest? Actually, if we were ever going to do that, now is the time. Spring is officially here and farmers markets are booming with fresh produce. 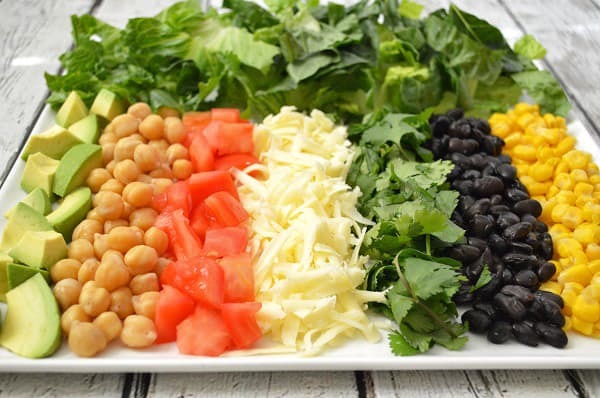 Salads are a perfect opportunity to try a few new foods, mixed in with a few family favorites. Plus it’s a SUPER easy way to eat more veggies. And get dinner on the table in just a few minutes. Why does my heart love this salad so much? Let me count the ways. It’s perfect when you have leftover food in the fridge, but not a lot of any one particular thing. You can add as much of any ingredient as you want, or as much as you have, and it’ll be healthy and delicious both ways. These ingredients aren’t fluff. They are serious food and even the ravenous bike commuter is stuffed. It’s ready in less than 15 minutes – perfect for baseball or swim or _____ practice during the week. Drizzle dressing over salad and mix well. Prices are based on what I’ve recently paid with my own grocery budget. See what I planned, ate and bought for April 2014 here. New to grocery budgeting and thinking about how much food costs? Let me help! Serve with a loaf of homemade bread for as little as 25¢ per loaf and you’ve got a delicious frugal meal! Remember that you don’t have to have exact measurements for this recipe – just use whatever you have and omit what you don’t. If you just so happen to have leftover chicken from taco night or from a whole roasted chicken, feel free to toss a cup into the mix! Changing the dressing is a fun way to give the same salad a completely new taste. A simple lemon vinaigrette, or ranch and buffalo would be way yum. Blue cheese would be amazing as well, but I’d skip the cheddar if you go that route. Or you can try my ultimate favorite dressing – blue cheese and buffalo. Oh. Yes. Now THAT’S what I’m talking about! What’s your ultimate favorite salad? Looks delicious! The fact that it is affordable is even better! It’s a winner! healthy and delicious! I haven’t tried many of your recipes as I am a vegetarian but I like “hearing” you, so I subscribed to your mailing list. You have many vegetarian recipes, I know, but I am intimidated by most dishes. I put this into this week’s menu. Last week was the first week we made a menu and stuck to it completely. Almost, depending on leftover situation. My husband carried lunch everyday. Which was probably a first in 8 years, when neither of our moms was here. They look askance at eating out often, understandably :-). Longer, really, because before we were married, he ate out almost all the time. And he worked, staying in company guest houses, before that. My husband was very happy that I mixed South Indian and North Indian dishes. I always try to but without a menu, it is not easy. Annnnyway, long story short, how can I make this spicy? As in, what will go with it? I plan to make my own ranch dressing because store-bought dressing is just ewwwww! Also, I have a mix of pinto and black beans frozen a while ago. Can I use the mix instead of just black beans? I’d appreciate your thoughts. And thank you for your posts! See you soon in my inbox! Oh and I just noticed your recipe rating request. I’ll leave a rating once eaten. Fingers crossed for sticking to the menu this week too! I realized that I don’t have to buy much in the way of groceries this week for the menu! Well, still need fruits and milk. I don’t make my own bread. Hope to start in a couple of months. Congrats Sangeetha for sticking to your!! And just so you know, it’s completely fine to deviate if it means eating up leftovers. 🙂 To answer your questions, feel free to use whatever beans you have on hand. 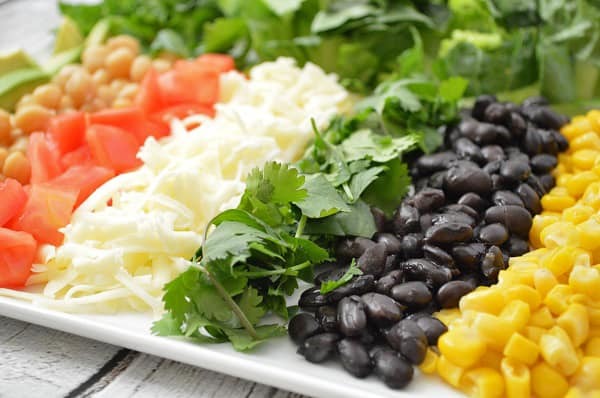 To make it spicy, I’d add the spices to either the beans (you can warm and season on the stove before adding to the salad since they’re already cooked), to the corn, or to just a portion of the ranch dressing since it’ll all get mixed in anyway. We made this yesterday and added wing sauce. Probably not the spices you’re talking about, but it tastes just as good with a bit of a kick!! Good luck on this week’s menu – you can do it!! Oh and we did manage to stick to the menu. I am so proud of myself! Thank you for your repeated “make a menu” admonitions! I hope to stick to the menu system always. Well, more or less stuck to the menu because on Monday, a neighbour gave us a main dish. So, everything got shifted by a day. That is why I ended up making the salad only today. I am on an empty-the-freezer frenzy. We are going to move soon. I’ll look at some more of your vegetarian recipes. Do post more of those. Or for the meat-containing ones, if you can add a note about how to make it vegetarian (and tag it as a vegetarian recipe or a can-be-vegetarian recipe), I’d really appreciate it. Hi! Just found your website! Love the aldis shopping list and your recipes. I was just wondering, can you tell me where the chicken comes in to the recipe? I’d love to make it as intended but don’t see mention of chicken in the ingredients list or instructions break down! Looking forward to your response! There’s no chicken in this recipe as written Ashton. If you want to add some, you can! I usually add 1-2 cups shredded chicken to feed 4 people.